Corry, PA -- Corry Micronics releases for production a series of hermetically sealed EMI filters. Many commercial and military applications require a mechanical package, which is completely impervious to outside environmental conditions. Corry Micronics offers these hermetically sealed industry standard broadband filters in ¼-28 thread with a .383 body and the 5/16-24 thread with a .702 body. Both mechanical packages are available in C, LB, LT, Pi and T configurations. Custom packages are also available upon customer request. Standard capacitance values range from .25 microfarads to 2.8 microfarads with DC working voltages as high as 400 volts. Current ratings from .5 to 15 amperes are available. 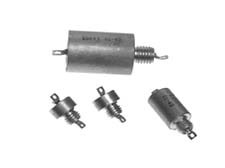 Hermetic feedthrus are popular in many facets of the electronics industry. Some of the more widely used applications are aerospace, military, microwave and cellular systems. Corry Micronics CEO Don Pavlek stated, "This product addition continues to add depth to our product line, which is an important part of our strategic growth plans." Click here to download product datasheets for Corry Micronics' line of hermetic feedthrus.